Lidén Klara is an artist. In her show Auf jeden Fall, Klara Lidén integrates videos of four new and recent performative actions into a sculptural display designed and made on site especially for the exhibition. It captures and reflects the prevailing climate of conformity and social indifference in present (western) politics and societies. 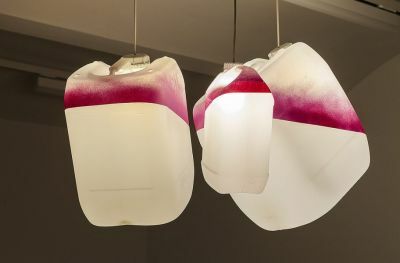 With its make-shift inventory, however – plastic water canisters converted into lamps, tarped-off worn site fences that serve both as video screens and room dividers – the installation suggests alternative concepts for acknowledging and dealing with resources. Black mono prints in second-hand metal frames are spread throughout the gallery. Made with tools, materials and everyday objects used by the artist – strip lights, tarpaulin, orange net, a bicycle tyre – they take the same line, while interventions filmed in Berlin, New York and in Vienna demonstrate possibilities and potential of unexpected and unorthodox acting. The choice of materials clearly links the exhibition to an urban environment and its ever-present ongoing transformation. The makeshift, minimalist aesthetics of the installation recognizes the openness and potential beauty that lies in imperfection; the atmosphere echoes both the charm and challenge of a rough-and-ready, improvised, nonconformist approach: one that makes do with what is available and skilfully turns this into more, as it calls to think outside the box of social conformity and convenience. What’s more, the sparse setting of the videos and their cool, muted palette point to an increasing coldness in today’s society. Karl Zwei Drei, a black-and-white video presented in the gallery’s first exhibition room, was filmed on a rooftop in early 2019. A 360° pan shot provides a panoramic view of Berlin’s urban sprawl, a colourless cityscape that seamlessly blends with the background, a drab grey sky. While the camera steadily moves forward, Lidén’s fellow artist and poet Karl Holmqvist can be heard counting, first in English, then in German: 1-2-3, 2-2-3, 3-2-3, … a simple but rigid repetitive pattern of numbers that may allude to thegrid of rules and conventions that influence communal urban life. In contrast to this, Holmqvist’s presentation in a singsong tone of voice while hopping from one leg to the other demonstrates an almost relieving playfulness. The short clip Out to Lunch (2018) shows one scene: In a spotless white kitchen that shows no sign of personal touch, but instead exudes chilled sterility, the fridge door suddenly is pushed open and out steps the artist rather matter-of-factly. Ironically, the only sign of warmth in this scene of escape comes from the warm light inside the fridge. Grounding, filmed in Lower Manhattan in 2018 for Lidén’s show at Reena Spaulings, documents an improvised walk of the artist through New York’s Financial District, a neighbourhood that is associated with power and control. Based on the choreography model of Massive Attack’s iconic music video “Unfinished Sympathy” from 1991, a steady cam follows Lidén who strides past landmarks like the New York Stock Exchange, and captures a sequence of hard falls onto the pavement. The very first scene already makes unmistakably clear what is at stake: Entering the street from a subway station, the artist suddenly slumps to the ground just in front of a banner that reads “The Money. The Power. The History.” only to instantly continue an ever-striving forward momentum, supported by the beat and drive of the soundtrack by Åskar Brickman. This choreography of walking while falling, falling back again into walking, striding, stumbling, struggling, and striving again demonstrates the fragility and vulnerability of the individual in regard to overly powerful corporations and capitalist key principles. At the same time, the determinedness with which the artist continues her journey, pursues her objective upon every fall – auf jeden Fall – not to give up, nor to give in, leaves a lasting impression. Conceived as a sequel to Grounding, Lidén’s brand new video A Walk in the Park (2019) was filmed while installing her exhibition at Secession. A collage of short episodes set to the beat of the first video’s soundtrack show the artist walking round Vienna’s historical centre. While the artist passes by the grand buildings and parks along the Ringstrasse, she carries a tarped-off site fence – like the ones that serve as screens in the show. For the most part, her body is hidden by the screen that merely provides a glimpse of her feet striding forward. The tarped fence resembles an empty white canvas, or banner; as an oblong white “box”, it largely fills the image frame when it pushes itself in front of the filmed scenery, thus refusing a complete view of the splendid architecture designed to represent power and wealth. Klara Lidén has built a sizable oeuvre of sculptural woks and installations as well as performative actions and videos since the early 2000s. Her interventions and outbursts of radical energy are calculated to disrupt and unsettle social conventions in order to call the routines of everyday life in question and undermine our habits of tacit coexistence, seeking to uncover repressed aggressions and potentials for resistance. Many of her actions, which may be described as a kind of creative vandalism, occupation and détournement are initially anonymous and covert.